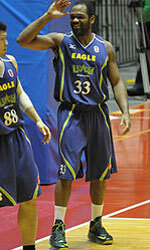 American Denzel Bowles (208-F/C-89) put on an extraordinary performance in the last round for Kanazawa Sam. 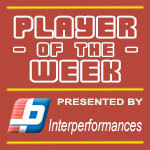 and that's him to receive a Interperformances B2 League Player of the Week award for round 38. The 29-year old power forward had a double-double of 36 points and nineteen rebounds, while his team beat Tokyo HT (#6, 6-33) 98-90. Kanazawa Sam. maintains the 4th position in their group in Japanese B2 League. Kanazawa Sam. is a typical solid league team placed somewhere in the middle or a little bit lower in the standings. They need more victories to improve their 16-23 record. In the team's last game Bowles had a remarkable 65.2% from 2-point range. He turned to be Kanazawa Sam. 's top player in his first season with the team. Denzel Bowles averages this season 21.5ppg and 11.5rpg. The second most remarkable performance in last round's games was 32-year old American center Wayne Marshall (211-C-86) of league's best team Shinshu BW. Marshall impressed basketball fans with 36 points, 4 rebounds and 2 assists. Of course he led Shinshu BW to another comfortable win 96-77 over the lower-ranked Ehime OV (#4, 16-23) being unquestionably team leader. It was definitely game of the week between two contenders to the top position in West. Shinshu BW consolidated its place in the very top position of the standings. His team has currently 31-8 record. Marshall is a newcomer at Shinshu BW and it seems he did not have too much trouble to become one of team's leaders. He belongs to the best scorers in the league with 22.3ppg (#9). He also registered 10.1 boards per game. The third best performed player last round was American Chehales Tapscott (195-F-90) of second-ranked Kumamoto V.. Tapscott got into 30-points club by scoring 35 points in the last round. He went also for fourteen rebounds and seven assists. Despite Tapscott's great performance Kumamoto V. lost 110-118 to #4 ranked Fukushima. But his team cannot count on just a single shooter as he also needs help of the other teammates especially in such crucial game. The last thing Kumamoto V. needs is to lose another game like this one. They lose more and more distance to the top teams in East. Their record is 28 victories and 11 lost games. Tapscott has a very solid season. In 32 games in Japan he scored 22.0ppg. He also has 8.9rpg, 4.6apg and FGP: 54.4%.